EARTH is the third planet from the Sun. From the vantage point of space, the Earth appears as a blue disk or blue marble that is mostly due to the vast oceans, intermixed with the characteristics of a clear transparent atmosphere and the brown or green coloured parts of the continents, peeking out here and there, of the places between the more regular patterns of clouds encircling the whole planet. From space, this celestial body appears as a thiving oasis, in a location that has outstanding complexities and the near perfect conditions for habitation for creatures like ourselves. Our Earth, within the our Solar System, it is quite unique and special, and at the present time, the only place known to hold life. Even in recent times, with the discovery of hundreds if not thousands of exoplanets orbiting other stars in the Milky Way galaxy, we have yet to find a similar world. Though the chances of finding real earth-like planets have vastly improved in the last decade or two, we have yet to find one. Till then, the Earth remains the only known home for us all. Diameter (Equatorial) : 12 756.2 km. Radius (Mean) : 6 371.0 km. Diameter (Polar) : 12 713.6 km. Mass : 5.973 6×1027 g. or 5.973 6×1024 kg. Mean Distance (AU) : 1.496 597 ×108 km. Aphelion : 1.520 977 ×108 km. Perihelion : 1.470 981 ×108 km. Highest Point (Mt. Everest) : 8 800 m.
Lowest Point : -10 430 m.
Earth compared with the other planets is moderately small, but this importantly contributes much to its appearance. Smaller bodies, like Mercury, the dwarf planet of Ceres, or most planetary moons, are unable to hold their atmospheres due to their gravitationally weaker masses. Without any atmosphere, there is not weather to erode and change their surfaces. As such, most of them appear heavily cratered, remaining little different since the Solar System formed. Larger planets than the Earth; like Jupiter, Saturn, Uranus and Neptune, are much larger and have stronger gravitational fields. These planets have held onto much of their original primordial atmospheres. They have no solid surfaces, whose clouds are made of various chemical compounds like ammonia and methane. Observations show their atmospheres have much high wind speeds, making them appear turbulant and chaotic. In the Solar System, the closest twin of the Earth, is the second planet from the Sun, Venus, which has a solid surface and atmosphere. However, as a planet it is shrouded in cloud cover, whose superhot and hostile atmosphere makes it unsuitable for life. Much smaller, is the planet, Mars, whose surface has held a tenuous atmosphere, but also has very low surface temperatures. Both Venus and Mars have the apperance of similar Earth-like effects of erosion or geological activity, importantly showing they have changed significantly since the Solar System formed. Some believe, that Venus and Mars were more Earth-like at an earlier time, such as having oceans of liquid water or temperate climates, but these have slowly changed into their hostile environments we see today. It appears that only the Earth has had the opportunity to be enhanced for lifeforms such as ourselves. Our home planet does have the advantage in its placement from the Sun and means it is neither too hot nor too cold for life. If the Earth were closer to the Sun, like the inner planets of Mercury and Venus, our oceans would soon quickly evaporate into space. If our world were among the outer planets, the oceans would soon freeze into solid ice. We happen to be in the narrow intermediate habitable zone, sometimes called the Goldilocks Zone, where significant liquid water can exist for life and its complex biology. We just happened to be 15 million kilometres or 10% closer to the Sun, and if this was not true, the Earth would be too hot. If the planet was 23 million kilometers or 15% farther away from the Sun, it would become too cold and liquid water would permanently freeze. As the orbital eccentricity of the Earth is almost perfectly circular, our planet fortunately moves completely within this narrow habitable zone. During the year, the closest approach of the Earth to the Sun, or perihelion, occurs on either January 3rd or 4th at the smaller distance of 147,088,067 km. Aphelion is placed furthest from our Sun, occuring on July 3rd to 6th at 152,104,230 km. We commonly call the Earth’s mean solar distance as the astronomical unit, measured precisely as 149,597,870.7 km. Since light travels at finite speeds, about 300 000 km each second in a vacuum, it takes rays of sunlight to traverse this gulf between the Sun and Earth about 499 seconds or 08 minutes 19 seconds. This figure varies only by 8.3 seconds throughout the entire year, due to the slight eccentricity of Earth’s orbit. Earth has an axial tilt of 23½° to the ecliptic, being tilted always towards the same direction in space as seen as the celestial poles. Each year, observers will see the day to day solar positions in continuous change in its daily apparent height or elevation above the horizon. This produces the annual seasons each 365¼ days. At low Sun altitudes, the slanting of the sunlight is more obliquely As these rays have to passing through more atmosphere this reduces the amount of received energy, which we recognise as the season of winter. When the Sun is at higher angles, the sunlight is more direct to the ground, making the warmer months of summer. Between these two opposing seasons are autumn - called fall in some countries (winter to summer), and spring (summer to winter). We understand much about the nature of the Earth, from the highest edges of space to the depths below the ground. 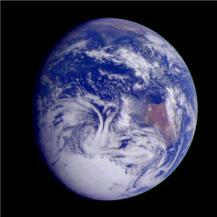 Our Earth’s atmosphere offers very useful protection and sustainability for all life on the Earth. It shields us from the continuous rain meteors, dangerous energies like ultra-violet or X-rays electromagnetic radiation, and stops most of the high energy or high velocity particles coming from the energetic Sun or the depths of space. Lying just above the surface is the lower atmosphere, whose 7 to 17 km. thick region sustains all the breathable air for life on Earth. Known as the troposphere, this habitable zone contains 80% the atmosphere, which acts like a giant blanket by absorbing much of heat and light from the intense solar radiation. This captured energy warms the planet and drives the weather. In addition, this energy ultimately creates the winds and tidal currents, and continues the so-called important water cycle — the transpiration (evaporation) of the oceans and the falling of water as snow, rain or precipitation. Each of the main atmosphic gases comprising air are mainly composed of only three gases; Nitrogen (78%), Oxygen (21%), with the often forgotten inert Noble gas, Argon (0.9%). Other smaller traces amonts of all the other gases, including about 0.04% of Carbon Dioxide (CO2), Neon, Helium, Methane (CH4), Krypton, Sulphur Dioxide (SO2) and Hydrogen. Saturating the atmosphere is water vapour (H2O), either as clouds or in clear air, making on average about 0.5% of its volume. Some gases, especially CO2 can have drastic influences on the climate by the so-called greenhouse effect, which can absorb and trap the energy from the Sun and prevent it escaping back into space. Its effects can make the surface and troposphere temperatures increase to adversely affect the weather, the climate and the water cycle. cycle. If unchecked, the continuance of plants and animal habitation as we presently know it could end. Such observed changes seen only in recent decades have almost certainly been caused by human activity who have collectively been increasingly using or burning more and more fossil fuels for their industries, food production, cars and electricity — all just to maintain their lifestyle and exploding populations. Consequences for these actions have slowly changed the careful balance existing between the solar radiation and the atmosphere — now commonly expressed as climate change. These changes are considered by some as being controversial, whose variances are considered as natural and not man-made. Science tends to differ. By humans simply process of burning carbon-rich fossil fuels and releasing the copious amounts of carbon once usefully trapped in oil and living trees, this creates the converted by-product of CO2. As the greenhouse effect takes hold, the usual average global atmospheric temperature of about 15°C, begin to rise by several tenths of one degree, but soon accelerates. This becomes sufficient to cause melting of the ice caps, and in time, rising of sea levels. In turn, the effect cascades and accelerates, causing the ocean temperatures also warm and release the once dissolved C02. Water vapour is also a notable greenhouse gas, and if the Earth does heat up, will only further increase the greenhouse effect. Over periods of decades, centuries or many millennia, significant effects on climate can generated by small changes in solar energy output or activity. Small variations could easily cause subtle but slow changes in both the local and global climate, possibly beginning the onset of Ice Ages or periods of warmer conditions. We know that over the last 15 million years that the Earth has experienced such changes many times, and some have been quite rapid. Obtained evidence has come from geological and anthropological studies, where we can document the rising and fall of the seas and the effect on the terrain of glacial formation and the history of the advancing or preceding ice caps. Even in the last 5,000 years, we have seen places of human settlement being occupied for centuries before the effects of the local climate forces them to find more suitable locations. An extreme example was the arrival of the Australian Aborigines some 40,000 to 60,000 years ago, when a land bridge existed between Asia, through Papua New Guinea, caused by sea levels being 200 metres below where they are currently today. Even the origins of the original prehistoric human migrations across the countless millennia may have principally caused of climate change. Some suspect the end of the last ice Age produced the extinction of our extinct cousins — the more cold-adapted and sturdy Neanderthals. Above the troposphere, the remaining 20% of upper atmosphere divides into several different layers of temperature and pressures. Next in height is the stratosphere, where the air becomes very cold, and so thin, that humans cannot breath in it. Above the stratosphere is the middle region of the atmosphere called the mesosphere, and roughly spans 50 to 80 km. This is where the atmospheric density and pressure is still sufficient to cause resistance for returning spacecraft or from the incessant and constant meteor bombardment falling towards the Earth. As such, the friction generated by the high velocities of re-entry causes the body to glow or form a bright visible streak across the sky. The mesosphere therefore provides a useful safeguard that would otherwise not stop destructive meteorites hitting the ground. On the edge of the upper mesosphere is the thermosphere. Lying 80 to 80 km. above us, the temperature begins to quickly rise, mostly caused by energetic ionised particles. Higher again is the ionosphere, where the temperature continues to rise. Here some of the air molecules are readily ionised by charged particles from the Sun and Earth’s magnetic field, or even space — where some atoms have their electrons stripped away At the height of about 200 km. the number of atoms decreases to the virtually perfect vacuum. We really do not know where the atmosphere truly ends, but it is somewhere above about 250 km, where most orbiting satellites are unimpeded. Beyond this is known as space or technically interplanetary space. Below the atmosphere lies the oceans or hydrosphere whose depth averages 3.8 kilometres. Below this, lies the true internal structure of the Earth. Only partly understood, and most of this information was obtained by earthquakes by the science of seismology. Under the surface lies the crust, whose thickness varies between about twenty-five to ninety kilometres. Earth’s crust divides into many plates that include the seven continents. Closer to the centre is the mantle, which contains higher pressures and temperatures than the crust. It is about 3000 km thick with the continents ‘floating’ on the mantle. Further down is the core, divided into the inner core and outer core. The outer core is liquid rock and is about 2,100 km thick, with the inner core is about 1,300 km thick and is all solid metallic material. Temperatures in this region are around 4,000°C at the pressure of 100,000 atmospheres. A map has been created of the surface of this solid sphere surrounding the core, showing many valleys and mountains, while radioactivity may keep the inner Earth hot. Earth itself is most composed of minerals containing elements like Oxygen (O), Silicon (Si), Aluminium (Al) and Iron (Fe). In the inner core, there is a higher content of Iron, Cobalt and other heavy elements. This is the Earth’s magnetosphere. Our Earth acts as a giant bar magnet, originating from the electric currents that flow through the metallic material. At present, the axis of magnetism is 13° from the true poles of rotation. Now the north magnetic pole being in Greenland, while the south magnetic pole lies off the Australian side of the coastline of Antarctica. This strong field is important for life, as it usefully protects the Earth from the large numbers of high velocity charged particles, like electrons and protons — the solar wind. This is especially important during strong solar activity, when the magnetic field captures the solar wind along the field lines entrapped in the apparent concentric rings of the Van Allen Belts. Trapped electrons, and oter charges particles, excite the thin gas 100 to 1000 kilometres in the upper atmosphere or, so that the sky literally begins to glow brightly. Generated electrical current are unimaginally huge, akin to a very large fluorescent light and produces the aurora. Most aurorae appears as coloured glows but some show either rays or curtain-like structures. In the northern hemisphere, this is the Aurora Borealis, but in the south, it is the Aurora Australis. Various attributed colours during some displays are due to different gases, mainly oxygen and nitrogen in the upper atmosphere. (See the four-part Aurora Australis Article). The user applying this data for any purpose forgoes any liability against the author. None of the information should be used regarding either legal or medical purposes. Although the data is accurate as possible, some errors may be present. The onus of its use is placed solely with the user.